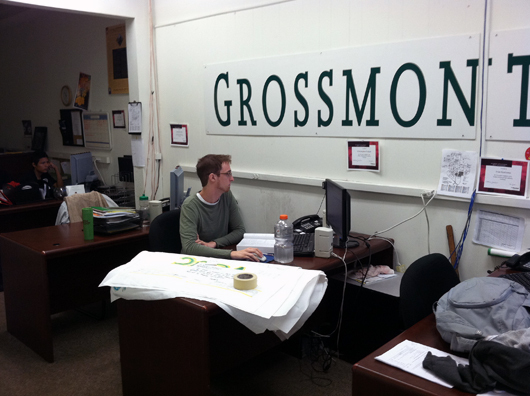 GROSSMONT COLLEGE- The Associated Students of Grossmont College, which coordinates many events on campus, is chaired by ASGC President Cheryl-Anne Phillips and is run by a board of directors who want more colleagues. ASGC meetings are open to all students and applications for board membership are available in both the Student Affairs office and the ASGC office. “If you have above a 2.4 GPA, time available between 8 a.m to 9::30 a.m. on Tuesdays and Thursdays, four hours available to give to office hours, six credit hours and your student benefit card, then you can apply to be on the board,” said Howell. Items obtainable with the student benefit card include unlimited popcorn, a prize drawing ticket, and savings at Ross Books and the Grossmont Bookstore, according to Howell. Sept. 11 remembrance tree planted Tuesday, Sept. 13, by left column, from front: Grossmont President Sunita Cooke, ASGC President Cheryl-Anne Phillips, Christopher Foskett and groundsman Martin Hipwell, and right column, from front, Tina Howell, Arianna Nevins, Samantha Elliott, Danielle Ramirez and groundsman Jack Newman. 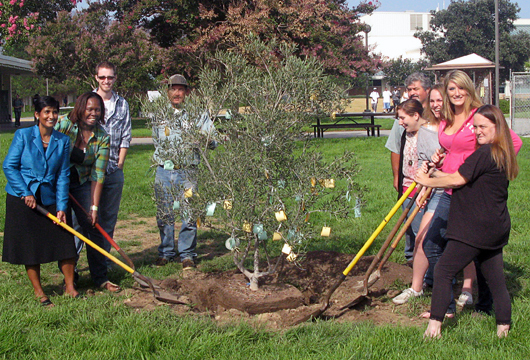 GROSSMONT COLLEGE- An olive tree was planted Tuesday, Sept. 13, in remembrance of the victims of the September 11, 2001 terrorist attacks. The tree was planted in front of Building 55. Messages written by students about the attacks dangled from its branches. Due to last Thursday’s countywide power outage, the campus was closed Friday which was when the ceremony had been originally scheduled. This meant that the ceremony had a small turnout due to students not knowing about the date change. The display was set up by the Associated Students of Grossmont College and featured two tall black boxes with American flag colored banners that listed the names of all the victims. The display also had an olive tree. Students were encouraged to write a memorial note on a card and hang it on the tree. GROSSMONT COLLEGE- Three sections of grass near the campus cafeteria were recently killed to make way for displays of drought- tolerant indigenous landscaping. Each section or zone will have its own unique landscaping: coastal sage, oak woodland, and mixed chaparral. according to Tim Flood, Grossmont’s vice president of administrative service. The landscaping was designed with help from faculty members in the biology, botany, and geology departments to serve as educational demonstration areas. The areas will be replanted in November or December and until then the dead grass will remain, according to Flood. GROSSMONT COLLEGE- As part of Grossmont College’s WOW–Week of Welcome–many clubs and programs were recently on display to enable incoming students to get a little taste of life on campus beyond the classroom. Such programs as the International Club, the Visual Arts and Humanities program, and the Associated Students of Grossmont College were among the organizations that took their messages to tables and booths at the Main Quad and other campus locations. GROSSMONT COLLEGE- In celebration of the 50th Anniversary of Grossmont College, the Hyde Art Gallery is exhibiting works by some of the most famous artists ever to live. Multi Media Works ‘Selections from Our Permanent Selection’ has an assortment of paintings, pictures, and sculptures from such artists as Roy Lichtenstein, Andy Warhol, and Pablo Picasso. “I tried to get as broad of a scope of artwork as I could and picked the pieces I felt were very influential,” Aubert said. “There are even pieces in here that were painted by the founder of the gallery Marge (Marjorie) Hyde. The galley hours are Monday-Wednesday 10a.m to 6:30 p.m.; Thursday 10 a.m. to 8 p.m. The gallery is closed Fridays through Sundays and legal holidays.